Every October, pink products invade the market for breast cancer awareness. And, while do believe in the cause, I don't always get involved in all of the product hoopla surrounding the month. This year, however, I couldn't help but gravitate toward a few of them. Read on to see my favorites. I've long been a fan of Gianna Rose's adorable designs -- and I'm not even a bar soap user! But this set of four French-milled pink square soaps, each accented with a BCA pink ribbon, really takes the cake. $25 at caswellmassey.com. 20 percent of the proceeds from the sale of each set will be donated to Making Strides for Breast Cancer. Philosophy's cult favorite moisturizer (and one of my all-time favorites) has been repackaged for breast cancer awareness month, appearing in a sparkly pink box and featuring pink wrapping. Hope permeates this product more than ever. $39 at philosophy.com. $5 from each jar sold will be donated to The Breast Cancer Research Foundation. This duo features the cutest pink blush, emblazoned all over with pink ribbons in different sizes and colors. The second piece is an absolutely gorgeous Lip Glaze -- Splendor -- a candy-colored pink liberally flecked with pink sparkle. $18 at sephora.com. 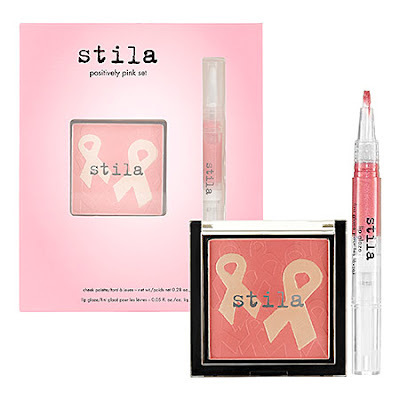 $1 from the purchase of each duo will be donated to The Breast Cancer Research Foundation. How much do you think is the shipping freight for these products. They look lovely and it's a worthy cause.